I know the cynics will continue to argue there’s no conclusive proof of climate change. But given much of Europe is freezing while we in Melbourne recorded the hottest day ever on record — 46.4 C according to the Bureau of Meteorology (that’s 115.5 F) — which follows on from the longest hot spell in over a hundred years — it’s hard not to think that the climate is changing, and that this may become the trend for the future. Penny Wong seems to think so. Just before 5pm, the car thermometer was claiming 47.5 C. Meanwhile the radio was telling us of big problems with fires around the state. 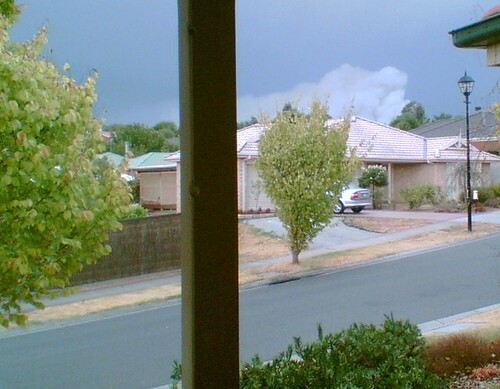 At dinner last night with friends in Chirnside Park, we could see smoke coming up from above the houses, somewhere a few kilometres away. It’s not an area I’m overly familiar with and my sense of direction was shot. I couldn’t quite figure out where it was coming from. Maybe northeast, but I’m really not sure. That evening we got back in the car to come home and turned on the radio. It was a shock to hear of more than a dozen confirmed deaths in the fires, with fears for scores more. The toll is now at least 35. I haven’t been in touch with them all, but I think all the people I know living in regional areas are okay. But to know there that hundreds have lost their homes — or even worse, loved ones — and that thousands are out there continuing to fight the fires… makes us city folk feel a bit helpless. I know I’m not alone when I say our thoughts are with you. UPDATE I’ve removed the links to the CFA web site. They are experiencing heavy loads, and have asked that people not use it unless it is essential to do so. Google have created a map showing the latest fire situation information from the CFA. It’s doubly useful because it shows it visually, and also helps take the load off the CFA and DSE web sites. I never would have imagined when they gave out all the fire warnings on Thursday, that this much devastation could have occurred. The number of houses lost is in the hundreds and the death toll is 65 and climbing. My best goes out to everyone involved. I remember Ash Wednesday. Realising that this is worse makes my skin crawl. I just read on BBC that Marysville is gone. I loved Marysville. I feel numb. I can’t believe the scope of it! Incredible to see that Google map and zoom in and see that settlement “gone”, that one “gone”, that one in danger. And the heat! For us, in Canada, 33 to maybe 35 C is the *HOTTEST* day. We open cooling centres, and declare heat emergencies. And to think it’s 10 C degrees hotter than that! And to fight a fire on top of that?!?!? Wow, my heart goes out to all affected. Please, if you can, give to the relief fund. So many with so many houses lost will need help to recover their lives. What strikes me is the shell-shocked faces in the videos on the Age site. A war of flames. I agree Daniel (on the topic of climate change) and whilst it’s tempting to attribute many of these seemingly freak weather events (take the floods up north as another example) to CC, we also have to be careful about such an approach. Having said that, with this general trend of continuing lower rainfall levels, increasing temperatures and the realisations of other predictions by climate scientists, one cannot help but feel we are observng the effects climate change on a daily basis. These observations are not just based on changing weather, but on such as (for example) animal behaviours (breeding, distribution changes etc.). What we should also recognise are the cumulative effects which cause events to spiral out of control – or at least to new and dangerous limits, such as happened with these fires. CC driven drought leads to drier forests and more dead trees, so when the temp is that little bit higher, they are likely to burn more easily and when they burn the flames travel faster etc. etc.. Wind also was a factor for sure. But where we generally think of climate change perhaps bringing a degree or two of higher temperatures and that won’t do us any harm for a few days every year, there are greater implications for even these small changes. Inceeasing mortality among the frail is another example. My heart goes out to those affected by the fires here in Vic. Credit to the folks in support services too for the risks they take and the work they do. The news of the fires seems to get worse each time I switch on the radio. It’s truly heartbreaking. As for whether climate change exists or not, for me it comes down to the way we seem to plunder every natural resource available. It doesn’t seem enough to say that the way we are living is unsustainable and whether it causes climate change or not, we should try to do something about it. Cockroaches in plague-proportions in Melbourne: how can that not be a sign? I didn’t even know what a roach looked like 20 years ago. Thoughts and prayers are with those who have lost family, had their properties and memories wiped out and whose lives have been affected in any way. Our community must stand together at this tragic time. I drove up to Marysville yesterday and saw all the devistation first hand. It was the most horrifying, upsettng and surreal thing I have ever seen. I loved Marysville, it was my childhood place. It was so beautiful and now it is just dead. I suppose that’s the only way to describe it now really. I’m still in shock.. nothing can prepare you for what it’s like to actually see it for yourself, it’s just absolutely shocking. My thoughts are with the residents who lost their homes/family members & friends. I’m happy to see everyone has donated so much.